Unfortunately for the eight people who like kebabs, Marina & Kebab is no more. But thankfully for everyone who likes alcohol and chili lime aioli crab cakes, there's Marina Bistro, a now-soft-open 38-seater with a wine cabinet-backed, butcher block-style bar and Chestnut-facing outdoor seating. Sporting 100% less kebabs, MB's churning out Ital-Greco-Medi-American fare like steak tartare w/ red onion, Dijon, and white truffle oil, sausage/chicken/salmon/prawn paella over saffron risotto, and apple-cabbage-slaw-and-cornbread-accompanied baby back ribs, so good they might give you the chilli's. They're also doing kebabs... wait, no... booze (there we go! ), with Pacifico and Blue Moon on tap along with seven bottleds. 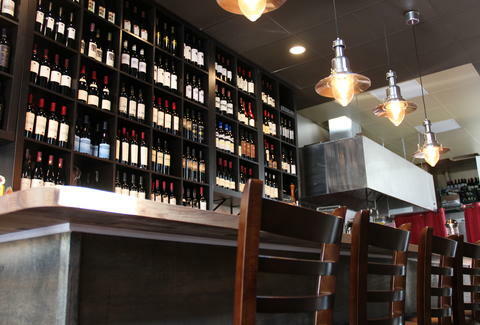 And because no wine bistro would be complete without, well, wine, this place is rocking over 115 available bottles (31 by the glass), and 11 half bottles, which's unfortunate for anyone who likes drinking.